Sonya Bandouil (right) embraced registered nurse Thuy Le while visiting Spaulding Hospital in Cambridge this month. The Bandouil family had stopped into the hospital to say goodbye to staff members that cared for Sonya during her stay. She awoke in a hospital bed, still groggy from the medication, a team of doctors gathering around her. She couldn’t speak. Couldn’t much move. Even now, a week after first emerging from a coma, Sonya Bandouil didn’t fully understand how she’d ended up here, in the intensive care unit of Brigham and Women’s Hospital. She knew she was injured. Her body was a mess of bandages and tubes. And every day, it seemed, she was being wheeled into another surgery. What she didn’t know was that over the previous two weeks, as she drifted in and out of consciousness in early November 2018, her family had been privately agonizing over how to tell her the worst of it. Now, as she slowly came to, a half-dozen doctors were approaching her bed and a nurse was pulling a curtain closed behind them. Her boyfriend, Alex Pankiewicz, put his hand on her shoulder. They began by explaining the freak accident that had put her here. 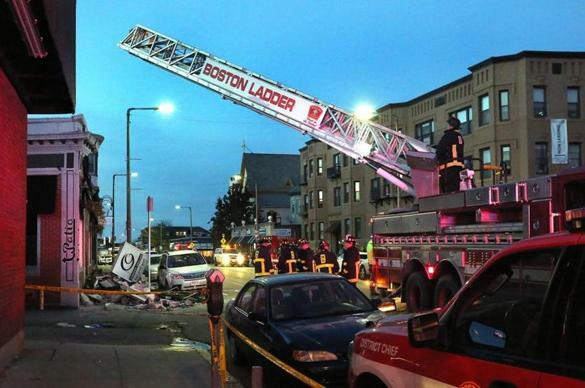 The massive concrete facade of a building in Allston had collapsed. She’d been hit and partially buried in the rubble, they told her, and one by one, began to list her injuries. Broken jaw. Broken leg. Broken pelvis. Broken vertebra. Most of the ribs on her left side were fractured. She had bled internally and bruised a lung. Repairing her had required nine surgeries. As they spoke, Sonya listened with a foggy detachment, nodding occasionally, understanding but not fully comprehending through the haze of medication — until they reached the final injury. All her life, she’d wanted nothing more than to be a professional pianist. Classically trained since early childhood, she’d performed on stages from Dallas to Germany and attended the University of Houston’s Moores School of Music. Just months earlier, she’d moved to New York to try herself in the forge of that great city. At the age of 23, she had felt on the doorstep of her dream. But now, one of the doctors was saying, her right hand was crushed in the collapse. Tendons and bones were smashed, and much of the skin ripped off. They’d managed to save it, they said, grafting skin from her arm and reconstructing her index finger. That was the good news. But they couldn’t salvage everything. When Sonya looked down at the hand, still partially wrapped in bandaging, she saw an empty space where her middle finger should have been. In the days that followed, Sonya didn’t speak, her jaw wired shut, a trach tube protruding from her throat. But when she was finally able to communicate a week or so later, she made it clear: She wanted nothing more to do with the piano. Occupational therapist Gretchen Young used a paraffin wax solution to treat Sonya at Spaulding Rehabilitation Center in Charlestown. “Forget about it,” she told her parents, who’d traveled to Boston from their suburban Dallas home, when they gently broached the subject. The thought devastated her, a cruel reminder of everything lost. As a child, it had been nearly impossible to pull her away. She began playing at age 5, when her parents, who believed the ability to play an instrument was an important part of a well-rounded childhood, put their three daughters in piano lessons. Her sisters would eventually tire of it, but Sonya never did. For hours she’d sit at the family piano, meticulously making her way through Beethoven, Chopin, and Rachmaninoff. She loved deconstructing a piece step by step, note by note, until she knew it so well she could play it without the sheet music and add her own flourishes. Onstage, during the recitals and high school performances of her adolescence, there was a certain feeling — difficult to explain — that came when the nerves and adrenaline faded and she forgot about the audience. She lost herself in the music. In college, she’d stay in the school’s practice room until 3 a.m. sometimes, working to perfect a piece for an upcoming performance or daydreaming about moving to New York and performing in the city’s vaunted venues. Alex, then an engineering student at the school, remembers the first time she played for him, shortly after they met — how it felt like he was being given access to something sacred. Sonya shared a moment with her boyfriend, Alex Pankiewicz, in her room at Spaulding Rehabilitation Center in Charlestown. After graduating in May 2017, Sonya joined Alex in Jersey City, just across the Hudson from Manhattan. She found work at a pair of music studios, teaching piano lessons five nights a week, and was invited to practice sessions with a local band. She enrolled in classes at New York University to study global affairs, at her parents’ encouraging. They wanted her to have a backup plan. But the piano was her passion. She was determined to make it her livelihood as well. In early November, finding themselves with a free weekend, she and Alex traveled to Boston to visit a friend. They toured the Harvard campus and strolled the Charles, and on their last afternoon in town, they found themselves walking along Harvard Avenue in Allston, a bustling stretch of shops and restaurants popular with college students. It was a beautiful fall day, crisp and cloudless. In search of a place to grab lunch before boarding a train back to New York, they paused to look in a restaurant window. Sonya remembers nothing of the sudden movement from above, or the sound of concrete crashing around her — a sound one witness compared to thunder. She doesn’t remember being buried, face down, in the rubble — or the onlookers who rushed to dig her from it. And she doesn’t remember her boyfriend, who, in the frantic minutes that followed, saw Sonya’s hand, bloody and mangled. 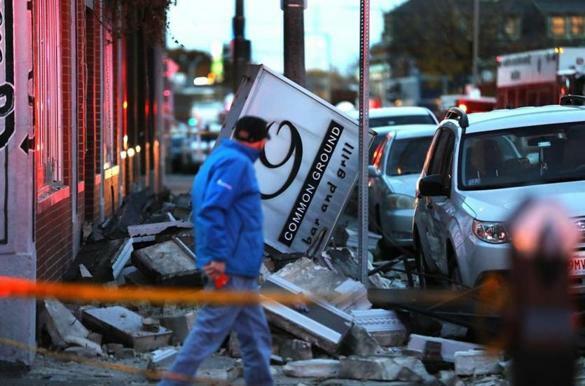 When the massive concrete facade of a building in Allston collapsed in November, Sonya was hit and partially buried in the rubble. To play the piano at an elite level — to traverse its 88 keys spanning roughly 5 feet — requires incredible dexterity. Even a minor issue with the hands can be debilitating, which is why some of the world’s top pianists go to drastic lengths to ensure theirs are protected. Some decline to shake hands for fear of injury; the famed pianist Lang Lang reportedly carries a sizable insurance policy on his. Losing a finger, then, is a profound setback. Aside from the obvious physical implications, it presents an even greater mental challenge. Everything Sonya had learned from the age of 5 would have to be relearned and recalibrated to account for the missing finger — two decades of muscle memory wiped essentially clean. Forget piano. Even for basic tasks, Sonya faced months of rehabilitation. She’d have to relearn how to walk, how to brush her teeth, how to grip a cereal box. Still, knowing the joy music had long sparked in Sonya, those close to her didn’t want to give up on it entirely. Even for basic tasks, Sonya faced months of rehabilitation. She’d have to relearn how to walk, how to brush her teeth, how to grip a cereal box. Her two sisters visited her in the hospital, coaxing Sonya into singing along with them to the Beatles — though the tube in her throat made it nearly impossible. Musician friends from Houston brought a copy of “Piano Concerto for the Left Hand” by Ravel, a piece of music famously written for an Austrian pianist who’d lost his right arm in World War I. Now, they told her, you’ll have something to work on. In late November, Sonya was transferred to Spaulding Hospital for Continuing Medical Care in Cambridge. One day, a musical therapist stopped by her room and left a portable keyboard. It sat untouched. A day or two later, Sonya asked her mother to bring it to her, and she let her left hand play across it for a few minutes before setting it aside again. As the weeks passed, her strength gradually improved. 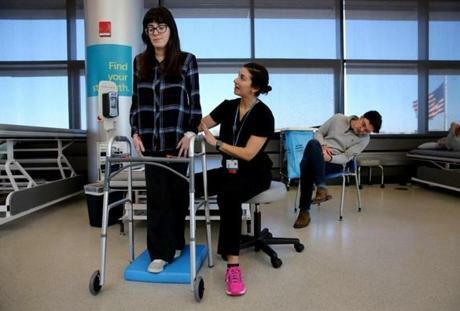 She was able to move from her hospital bed to a wheelchair for the first time. In January, she was well enough to move to Spaulding’s sprawling rehabilitation center in Charlestown. There, Sonya took her first steps, navigating the hospital’s hallways with the aid of a walker. Sonya’s mother, Yelena Lutsker, comforted her daughter. As the weeks passed after the accident, Sonya was able to move from her hospital bed to a wheelchair. 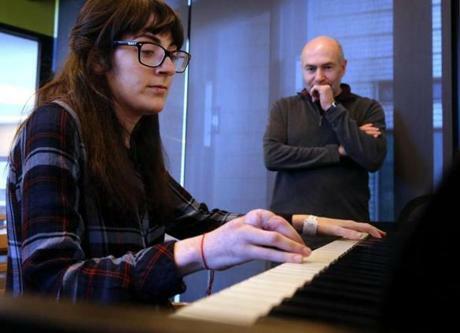 By happenstance, the new facility had a piano, located in a fourth-floor rec room, and after a week or so of her parents’ gentle prodding, she agreed to sit down and give it a try. She managed to make it through a Bach “Minuet,” a relatively easy piece, without much trouble. But then she attempted a more advanced piece, a prelude by Chopin. In her head, she knew what to do. But her right hand betrayed her, refusing to keep up — the music trapped in some purgatory between mind and body. “I walked away, and I was like, ‘OK, I’m done,’ ” she said later. Her parents gently pushed her to return, and a few days later, she once again took a seat at the piano. A few days after that, she did it again. It was rarely pretty. Some days, she was able to take small consolation in being able to play anything at all. Other times, she left the piano in tears. Privately, she wondered whether it was even worth trying. She did her best to stay positive. She spoke with her childhood piano teacher, who offered words of encouragement. She Googled musicians who’d lost fingers or hands and still managed to make music, taking solace in their stories. Once or twice, in the aftermath of a grueling day of therapy, Sonya was surprised to find herself looking forward to taking a seat at the piano. Her father, Dmitry Bandouil, watched as she played last month. Once or twice, in the aftermath of a grueling day of therapy, she was surprised to find herself looking forward to taking a seat at the piano. Nothing about her life over the past few months had been normal. 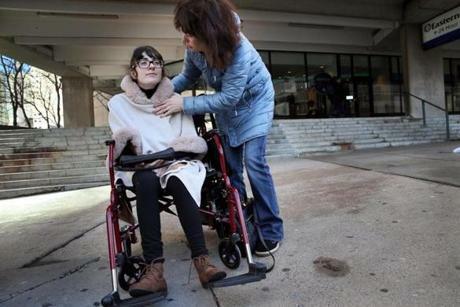 Her parents had moved into a short-term apartment in the Fenway to be near her; her trips outdoors were limited to short jaunts across the hospital courtyard in a wheelchair. Even after three months of rehab, she couldn’t walk more than a few feet on her own. Here was something that, for a few minutes at least, felt familiar. On a weekday afternoon last month, Sonya shuffled slowly into the fourth-floor rec room at Spaulding Charlestown and, setting her walker aside, took a seat at the piano. Tucked in a corner next to a Ping-Pong table, it was a far cry from the stages and recital halls where she’d once performed. But here she was, atop a pair of phone books stacked on an office chair, a white hospital bracelet hanging from her wrist. She began to play, tentatively at first — starting, stopping, starting again. But before long, her hands began to move with purpose. Her shoulders loosened. She played Czardas by the composer Monti, a rousing piece she’d mastered back in high school, and for a few minutes, seemed to fall into a groove. The weeks and months ahead would be marked by uncertainty. The following day would be her last at Spaulding. Soon, she’d be returning with her parents to Texas to continue rehab, and eventually head back to New York — though her future as a pianist was far murkier. Her prospects as a solo performer, she knows, are almost certainly gone. And no matter how many hours she devotes to relearning, it’s unlikely she’ll ever reach the level she once attained. She remains unsure how long it might take to even begin narrowing that gap. Sometimes, she’s unsure she wants to find out. But she can’t quite leave the piano behind, either. Even if she never takes another stage. Even if she’s playing for no one but herself. Her first piece wound to a close, and someone suggested another. And slowly, her hands began to move once again, and the small room filled with music. 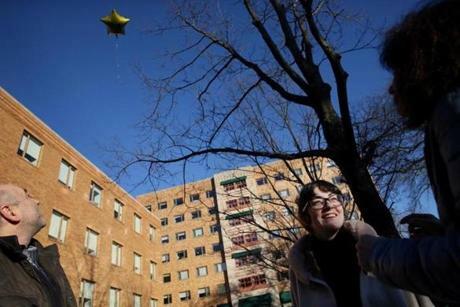 The Bandouil family released a balloon as they departed Spaulding Hospital in Cambridge, as a symbol of letting go of their struggles and departing Boston.